Explain the principle of regenerative circuit. Principle of regenerative circuit is recovering the energy available with returning oil by using regeneration technique. The concept of re-generative circuit is explained from following figure. Consider the double acting cylinder. Pressurized oil from pump is admitting in cylinder cavity through port (A). Due to pressure force piston is moving from right to left. During this movement, the oil present on piston rod side of piston starts coming out through port (B). This oil will return to the oil reservoir via DC valve. It is clear from figure that, returning oil will enter in pressure pipe through pipe ‘P’ During exit of oil through port (B), some energy is still there with oil on piston rod side. This energy is otherwise wasted if this oil directly goes to oil reservoir. 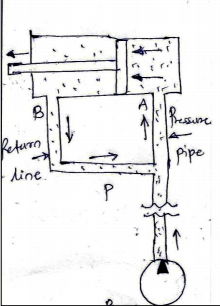 To avoid wastage of this energy, pipe ‘P’ is connected so that, the pressurized oil gets more energy and it will create more pressure force while entering through port (A).